Don’t feel it’s necessary to promote your giveaway the final day before it closes? Big mistake! In the last three giveaways we’ve run on our homepage, Facebook page & blog, each received a quarter to a third of the total accumulated entries during the final 24 hours. Surprising? Maybe at first. But think about it… don’t you always put off entering giveaways until the last minute? Yeah – me too. While promoting during the last 24 hours of your giveaway, you’ll want to promote with a sense of excitement but most importantly with a sense of urgency. We’ve listed five tips below that will help you make the most of the last day of your giveaway to help maximize your giveaway’s total entries. If you have any control over when your giveaway ends, make it end on a Monday night at midnight. Giveaway entrants happen to be most active Monday nights, particularly between 8pm to midnight EST. Take advantage of that! Tuesdays and Wednesdays might work as well. Thursdays are alright. But Friday, Saturday, & Sunday — those are days you should try to avoid if you can. Sometimes it’s tough to avoid though (ex: if you run a monthly giveaway and the month ends on a weekend). Note: If you end your giveaway on Monday, the below tips only be amplified. For the rest of the post, we’ll assume that your giveaway ends Monday at midnight. Plan out a newsletter that you can send to your subscribers 24 hours before your giveaway ends (linking to your promotion). A full day is plenty of time for folks to open, read, and enter your giveaway before it closes. In addition, if you make it part of your giveaway’s terms and conditions that entrants may be emailed during the promotion, you might shoot over one final email to get them excited about the potential of winning the giveaway in the upcoming day or to give them one last chance to refer their friends and increase their chances. *Noob Error* Don’t send out the email several hours before the giveaway ends; give folks ample time to get in front of their computers. You may have an unhappy army of potential entrants emailing you back (possibly from another time zone?) if you send out an email a few hours before your giveaway ends. We’ve made that mistake before — it ain’t pretty! On Monday morning, after your email has already been sent, think about getting your Facebook fans excited. That shouldn’t be that hard to do, right? After all, your giveaway has an awesome prize, time is running out, and a winner will be selected soon! Includes a few call-to-action messages & a sense of urgency. Create a Facebook page status that bottles up all this excitement. 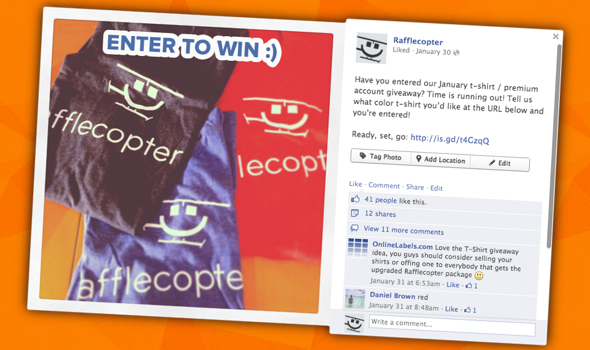 A big image w/ a call-to-action helps (‘enter to win’ is a favorite of ours). Again, a sense of urgency goes a long way as well (‘last day to enter!’ or ‘giveaway closes tonight!’). Placing a link to the giveaway is a must (*note* if your giveaway is running through the Rafflecopter Facebook app, use your giveaway’s mobile-friendly share link). Need a few more ideas to get a little extra visibility? Try to incorporate hashtags into the post (#giveaway, #win, etc. ), change your cover photo to promote your giveaway, highlight your page status, or pin the page status to the top of the page. Nice – so now your Facebook page is rockin’ and rollin’. If you have an audience on Pinterest, it’s time to get to pinning! This is where you can get visual and make your entrants drool, especially if you’re giving away a prize pack that teaches you how to make Sweet Cherry Love Muffins. It could be something as simple as pinning a few exclusive images of the prizes you’re offering. Or how about a banner that describes your promotion and links to where it’s taking place? And Pinterest, like Twitter & Facebook, allows you to use hashtags in your pins. Why not take advantage? Of the social media outlets mentioned above, you might say Twitter is the best for an immediate response. Send out a few tweets during the day that effectively counts down the time left to enter. Include appropriate hashtags and call-to-action messaging in your tweets. No need to stay up late to tweet these messages at specific times. Just Google the term ‘tweet scheduler’… you’ll find a myriad of apps that will send out scheduled tweets for you. If we had to recommend a couple, you might want to check out Buffer and Hootsuite. It was tough keeping this post limited to only five tips; I can think of a handful of other ways to promote your giveaway in the last 24 hours. Have any tips or tricks that worked for you? Comment below! I really appreciate the first tip. Seems pretty logical now that I think about it. I’ll try it out next time I run a giveaway. Tee hee! Thanks for including my tweet in the mix, Greg! And I definitely picked up a few more tips myself…namely ending a giveaway on a Monday night if possible. Good to know! Thanks, Rafflecopter. It’s true though – everyone loves a countdown :P Thanks for the suggestion! Yep! I’ve found that ending them on Thurs, Fri, Sat. and Sun are real losers. That is especially true if they have a 48 hour window to respond with info for shipping the prize. I hadn’t thought of the count down. Might try it. The last couple of weeks have been S L O W !!! with traffic and entries for giveaways. Comments? Summer months have always tended to be a little slow in relation to months surround the holiday season. Could be a reason! Love the info from you guys! Thanks for the Monday night info! I was going to end on Friday — not doing that now! One thing we’re doing to generate the buzz on the final day is, we have 3 prizes. $50 dining certificate, $100 dining certificate and grand prize is an Ipad Mini. Our 3rd prize will be chosen at noon, our second prize will be chosen at 3pm and our grand prize winner will be chosen at 9pm. This will keep the buzz going on FB & Twitter all day long, along with reminders that they can enter again and again for more points. ALSO – thanks for the tip of emailing the contest entrants on Monday morning with a reminder! I love the “countdown urgency’…. next time for sure! You’re full of some GREAT ideas – thank you! Also you can modify the tweet users share to hype up the final day. Great tips! We ended ours at midnight on a Sunday, and missed out on that extra 24 hours of traffic. Oh well, now we know! Saw this just in time, our giveaway ends tonight at midnight, so I just scheduled the count down on my TweetDeck. Thanks a lot! Great tips ! Thanks ! This was my first time using Rafflecopter for a giveaway. Thanks for these great tips. Have added them to my giveaway checklist. Top tips. I missed them for my most recent give away – but I’ve saved them for next time. Great tips! Was going to end my giveaway to Sun midnight 9/29/13 but was able to change it to Monday. Thanks! Great article! Very helpful. THANK YOU!! Had no clue about Tip #1. Just stumbled on these tips — they’re a great help! I knew not to schedule anything to end on a weekend (as my views drop pretty significantly), but I wouldn’t have thought Mondays would be the most active! Thanks for the suggestions. I just scheduled countdown tweets. Can’t wait to see what happens. I’ve been posting facebook reminders all day. This is my very first giveaway so these were the best tips ever! I’m so excited because it has brought so many new visitors and subscribers! Thank you. I submitted my giveaway to some sweepstakes sites… that increased my submissions a lot. What are some of the sweepstakes sites you’re talking about? I haven’t heard of this before. Thanks! I was wondering if I could do a giveaway and manually enter the people in my group? I created a small group challenge and assigned different levels of points for commenting on a post, liking a post, registering on my website and also for filling out a short survey. I’m assigning differnt point values and not sure how to track it on here, but is there a way for me to manually enter the participants and then assign their points and then hold the raffle based on that? Please advise, I would love to try it out. My giveaway at carmyy.com for a $30 gift certificate for Oiselle ends on June 8th, 2014. Don’t forget to check it out! Also, I’ll keep tip #1 in mind for my next giveaway! That’s news to me! Great Tips!! I had so many entries!! Thank you! I just started my first giveaway ever and I just scheduled some tweets and Facebook posts. Thanks for the tips! This is SUPER helpful, thank you! using all of this for our next giveaway! Actually – one more question. What’s the ideal length of time to run a sweeps? Is a week too short to allow max entries? Is a month too long for excited entrants to wait? Hey Raymond – it ultimately depends on a few factors. I’m writing an article that will discuss that further, but in the meantime, here’s a screenshot that might help you decide how long to run the giveaway based on your prize’s ARV. Edited: PS – LOVED the countdown tips & ending it on a Monday…I definitely noticed a difference in our stats. Glad that was helpful! In the next week, we’ll be releasing a pretty in-depth manual that discusses giveaway best practices, so be prepared for some great tips. This image was just a sneak peek. Cheers! My giweaway at http://goo.gl/t4Krd2 for free Antivirus Licenses from BITDEFENDER worth € 39.95 ends on 13th July 2014. Thanks for grt tips! Will keep the Monday Midnight deadline in mind for the next giveaway. Can you also recommend the top sites for submitting your give away? Thanks a bunch for these tips! I just scheduled the countdown for our Giveaway which ends tonight. Now I’m off to create a few more Pin images to use today! Thanks for the feedback! We’re glad to hear you’re finding our blog helpful :) Please don’t hesitate to reach out to us if we can be of any assistance with your first giveaway. Having a Twitter countdown is a great idea! Will do that later; my first-ever giveaway is ending tomorrow. Hopefully, it’ll help get more entries. Thanks for these tips!